Neighbor Hubs – A guide to Living Intentionally in your Neighborhood. Fiducia’s mission is to infiltrate and reshape neighborhoods for Jesus by deploying Christians from their doorsteps. Step into the journey of loving your neighbor next door by becoming a Neighbor Hub! This 60 page guide describes a step-by-step process in creating relationships for the Christian(s) looking to live out their faith in tangible ways. Although there’s study material, this book is best described as an instruction manual and not necessarily a Bible study. Section 1 prepares you for mission, while Sections 2 and 3 are tailored for those looking to engage as individuals or in group settings. 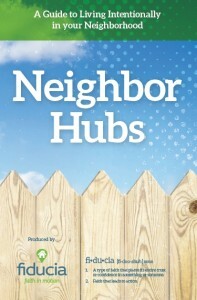 If you’ve ever desired to build community or create a neighborhood ministry, then Neighbor Hubs is perfect for you. To get your copy, simply click here!